Beautifully remodeled 1 Bd condo in centrally located full service high rise building. 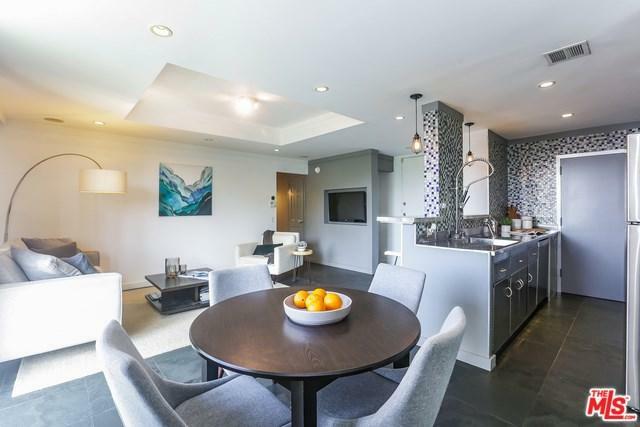 Modern designer finishes throughout including Slate floors in living room, stainless steel appliances, and counter tops in the kitchen with mosaic tile back splash. Walls removed on kitchen wall to provide custom breakfast bar and open feel to the living room. Rich wood floors in bedroom with great closet space throughout. Master bathroom has granite counters with separate bath tub and shower adorned with subway tiles. A balcony with westerly green belt and Sunset views to enjoy coffee in the morning and cocktails at night. Located next door to Four Seasons Hotel, close proximity to Beverly Hills , West Hollywood, world class Restaurants, and Cedars Sinai medical center. This luxury building offers 24 hour security, concierge, pool, gym, conference room and tennis courts. Sold by Ixchel Mazer of Dynamic Properties.